Speaking with Kol Chai Radio, Bayit Yehudi leader Naftali Bennett explained that Yoni Chetboun during a party faction meeting voted in favor of criminal sanctions as part of the chareidi draft law. Bennett added that in the Knesset plenum he opposed the sanctions, but in the party forum the only one to oppose the sanctions was Moti Yogev. Bennett tried to discredit Chetboun, who was praised by the chareidi and dati leumi torani tzibur for voting against the chareidi draft in Knesset. 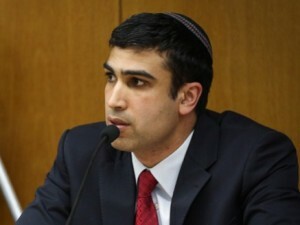 In response, Chetboun stated “I do not apologize for voting against a blow to the Torah world in contradiction to Bennett”. Bennett used the radio interview to address the resignation of Eli Ochana, whose appointment on the lineup caused significant damage to the party in the polls. “I erred with the appointment of Ochana on the list” Bennett explained. When asked about the deal he made with Yesh Atid and Yair Lapid in the outgoing administration, Bennett stated “I never dreamed to what degree he would hound the chareidim”. Regarding the next coalition government, Bennett stated “I am not entirely sure that Netanyahu will pick up the phone and call us first. We are not easy partners when it comes to compromise regarding a greater Eretz Yisrael”. He stated that he would prefer sitting in a coalition with the chareidi partners. This is such pathetic garbage making it impossible to digest 😝!!! It’s easy to understand why Netanyahu has misgivings about this guy, Bennett. You would think that natural coalition partners would avoid stabbing each other in the back. Perhaps if Bayit Yehudi would discard it’s “leader”, then Netanyahu could cozy up to the party more. it’s not like he was voted into leadership by primaries. yeah, let them have it. you can say that NB has done more for the Charedim than Chetboun ever will by working to integrate ultra orthodox men into the workforce….